2.i) What do you know Short the Sindhi language? 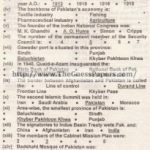 See on Page # 73 .
ii) Write any five important features of Pakistani culture. Pakistani society is story multilingual and multicultural . iii) Explain the relations of Pakistan with China. Both Pakistan and China are the neighbours and trustworthy friends due to which Pak-China friendship has become exemplary. As the foreign policy of Pakistan is based on the peaceful living with the neighboring countries, she has very friendly, pleasing, peaceful and helpful relations with China. Pakistan, immediate after the freedom of China, Pakistan accepted it. China has given full support to Pakistan on the Kashmir Issue. China has supported morally and militarily Pakistan during the two wars with India. Pakistan has played very’ crucial role in bringing America and China together. Whatever the mea§ufeswhich have been taken by China in support of Pakistan inside and outside of United Nations Organization,should have given weightage. See on Page # 63.
v) Describe the importance of the Ileographical location of Pakistan. vi) What is the importance of Agriculture in the economy of Pakistan? vii) What are the important Natural resources of Pakistan? 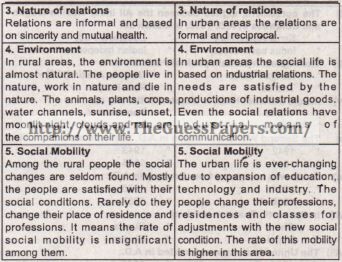 viii) Describe any five differences between in Rural and Urban society of Pakistan. 3. 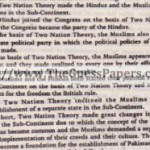 Describe the important political eats from 1940 to 1947 in the Pakistan movement. 4. Write a comprehensive note on the aims and objectives for the establishment of Pakistan. 5. Discuss the fundamental principles of the Foreign policy of Pakidan. .